Before the season started there were many, both at the Arms Park and across the Principality Premiership, who were impressed with Steve Law’s recruitment work. However, you may well have been hard pressed to find even the most ardent Cardiff RFC supporter who would have predicted that, as the season reaches February, the Blue and Blacks would be second in the league just four points off the all-conquering Merthyr. It was an admittedly slow start, with just a single win from the first four fixtures, but since then there has been just a single loss from 16 games meaning that, barring a total and utter disaster, the threat of relegation or a play-off with the top Championship team has been averted. The basis upon which the good form has been built is much varied. The aforementioned good recruitment is key, a lack of injuries and clever squad management has been important, and a level of fitness that most Premiership teams do not have has set us apart. However, one important aspect of our game has seen us through, and that is the ability to out-score opponents no matter what. Defensively, Cardiff RFC find themselves down in ninth of the ‘points against’ Premiership table, with only Newport of the top 10 having conceded more than our 395 points. That equals just over 20 points per game. However, on the attack only Pontypridd have score more points than the Blue and Blacks, with the 591 points scored thus far coming in at over 31 points per game. 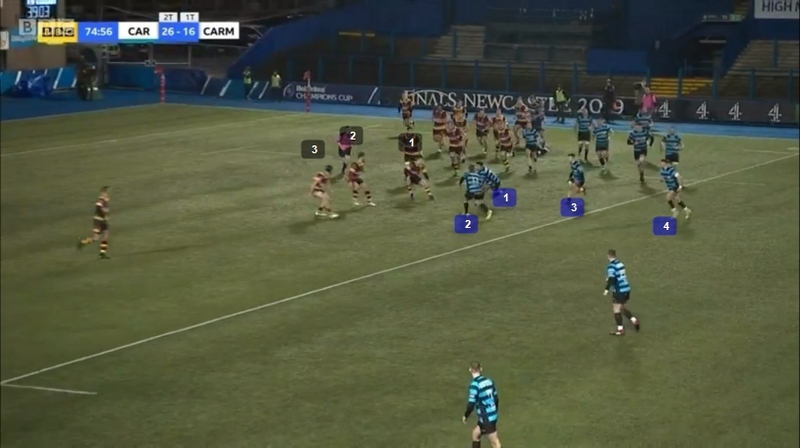 Looking at the two televised Cardiff RFC games this month, the attacking shape of the team coached going forward by Llyr Lane is very impressive, similar to that which the Cardiff Blues used at the start of their current attacking evolution in the early days of Matt Sherratt’s coaching. What we see is a rugby league tactic to open up space on the outside, whereby the first receiver has two options; the pop pass to the short runner or the pull back to the screened player. Effectively executed for maximum impact the short option acts as a dummy runner, as Joey Tomlinson does in the circle, holding up a defender and creating an overlap on the outside to be exploited. Unfortunately on this occasion the wrong option is selected on the outside, but even then metres are gained and front foot ball is secured. 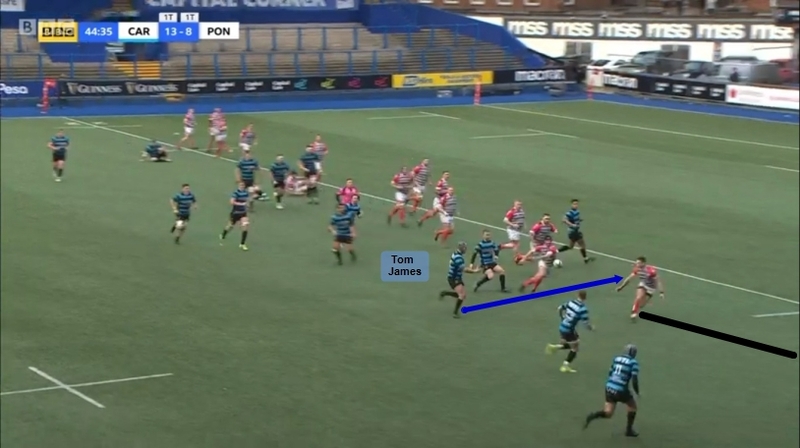 What comes before this called move is important, with Cardiff RFC firstly having a strong set of ball carriers. Tomlinson, Sam Pailor, Thomas Daley and Morgan Allen shown in the clip, as well as Cardiff Blues players Rhys Carre, Ben Murphy and Callum Bradbury all put in a lot of work fronting up. 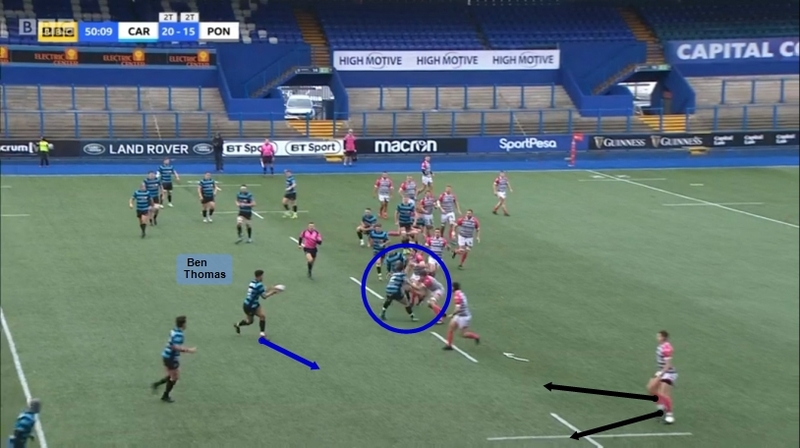 That creates the uncertainty of guarding the short runner, while there is also the dual playmaker threat that the Blue and Blacks have either through Gareth Thompson and Ben Thomas, as in these two games, or when Steffan Jones comes into the side and Thompson drops to full-back. They can split the backs in the defence to create mis-matches, but what really adds to the attacking shape is the simple use of the blindside winger. There are a number of elements that make up this excellent try; Will Rees-Hole slotting in to first receiver and Ben Thomas holding Alex Knott on a dummy line to allow Gareth Thompson to get wider before a perfect miss-pass to Ed Howley joining the line well from full-back. However, it is the presence of Tom James to allows the attack to switch from a good attacking shape, to a dangerous try scoring move. The line he runs from the blindside wing causes Pontypridd winger Cam Lewis to stay very narrow for fear of being beaten on his inside shoulder. As a result there is a huge amount of space on his outside and the decision taken by Thompson is a good one before the well executed two-on-one. This shape not only creates space on the outside though, but creates opportunities through manipulation of defensive lines in midfield. On this occasion the presence of the blindside winger coming off the first receiver draws the attention of the defender as, in the first clip the Carmarthen scrum-half moves too wide from the scrum to cover Tom Williams, allowing Gareth Thompson to step inside him and exploit the space left. This try is, in initial shape, very similar to that which Joe Gatt scored against Pontypridd in the clip above, however Carmarthen have done their homework on that clip. Ben Thomas goes in at first receiver, Jack Roberts comes on the dummy line with Gareth Thompson sliding wide again as Tom Williams comes across as the blindside winger. 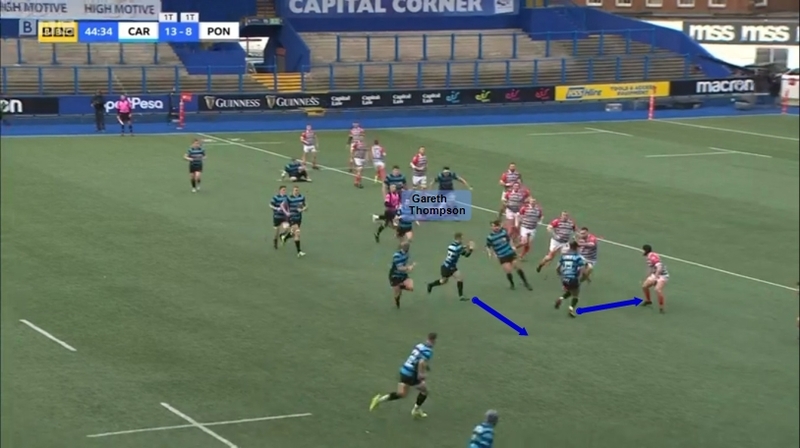 However, with defender one watching Thomas and defenders two and three tracking Thompson and Williams, Roberts is able to carry through two weak Carmarthen shoulders not set to make a tackle and jog under the posts. 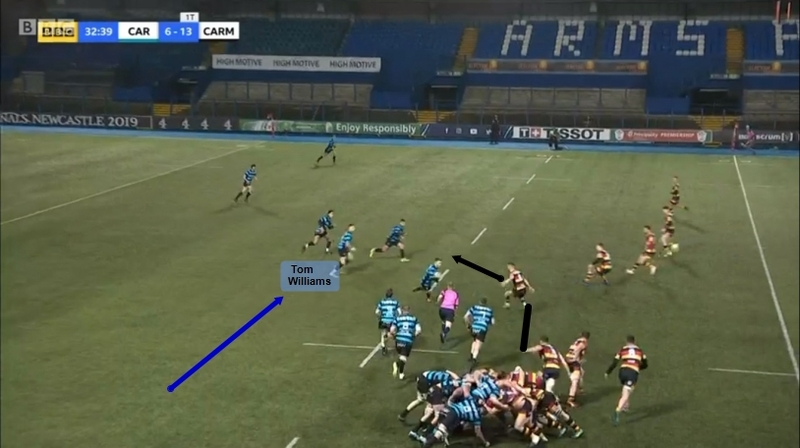 The Cardiff RFC attacking machine is an effective one, and with a much improved defensive performance against the Quins last week there are signs that the general level of the Blue and Blacks can only improve. This week it is Cup action away at RGC in North Wales for Steve Law’s men and a chance for Ed Howley to step into that second playmaker role from full-back. If they can develop yet another player comfortable at first receiver then there is a possibility for the attacking shape to develop even further.